Samsung's been making big tablets for some time, including moonlighting as the maker of the Google Nexus 10, which stood out thanks to a screen that roundly beat the Retina display of the iPad Air for high resolution. But some found the plastic back of its earlier tablets too, well, plasticky and looked for something a little les low-rent. Here it is. 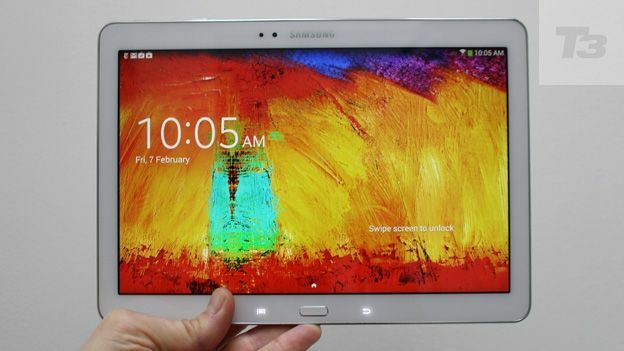 The new Samsung Galaxy Note 10.1 (replacing the original Samsung Galaxy Note 10.1) has incorporated the design found on the popular Samsung Galaxy Note 3, Samsung's phone-tablet hybrid with a 5.7in display. True, the faux-leather design of the Note's rear cover, complete with details such as an edge designed to look like leather stitching didn't please everyone either, but this is definitely a classier tablet. It's not cheap, but that's one of its few issues. But the design changes don't stop there. The scooped edges of Samsung's earlier tablets and even asymmetric finishes on some models are all gone, talking the same design language as the Samsung Galaxy S4. Straight lines, solid bars of metallic edging and a gloss front all contribute to a more serious, grown-up feel than some previous models. It's easily Samsung's best-looking tablet yet. It feels solid, too, without being heavy - the plastic back keeps the weight down, though it is heavier than the iPad Air. It weighs 540g against 469g for Apple's flagship and measures 243.1 x 171.4 x 7.9 mm. This means that it's 3mm longer than the Air, but the width and depth are almost the same - the iPad Air measures 240 x 169.5 x 7.5 mm. It also means it's noticeably shorter on its longest side than Samsung's latest tablet. This hardware looks light and appealing - something Samsung has always been good at. The Note 10.1 2014 edition comes in black and white options. Black looks more sober and business-like, but white is brighter-looking and inviting. This is a Note, not Samsung's other tablet brand, the Tab. Which means it has a stylus included. This is the S Pen and it adds extra functionality to the tablet. It hides in the top right corner of the tablet and is a slim oblong with rounded corners. Super-thin pens are often too fiddly to use, but this is a decent fit in the hand. You pop it out of its resting place with your thumb nail. As you do, it launches a specific menu of S Pen-related tasks in a wheel called Air command including Scrapbooker, which lets you draw a loop around text or images and save it to a Scrapbook app. There's also Action Memo: you can scribble a phone number on the sticky note that appears, which is handy. But then you can tap Link to Action, which recognises the number and saves it to a contact. This works well. It's a feature from the Note 3 where, being a phone, there was also the option to dial the number. The stylus is well-implemented and there are lots of uses to investigate. Do try not to lose it. There's also TouchWiz, Samsung's special overlay. The icons are now looking rather old fashioned and childish, somehow out of step with this sophisticated hardware, though recent Samsung tablet announcements at CES (including the Samsung Galaxy Tab Pro and Samsung Galaxy Note Pro) tell us we won't have to wait long for an update to the software's look. Mostly, TouchWiz works as a shortcut menu to lead you to browser, email, maps, YouTube and more. Then there's My Magazine, which is essentially Flipboard structured for this screen and works tremendously, but you could always download Flipboard anyway. The Note 10.1 has the facility to split the screen in two for multiple apps online at the same time. This is very useful. It doesn't work for every app, but it makes a tablet much closer to a PC in terms of multi-tasking usefulness. Like some other tablets, an infra-red blaster and suitable software (WatchON) mean you can use the Note 10.1 as a TV remote control as well. You won't lose it down the back of the sofa and it has an enjoyable and informative interface. This is a gorgeous screen. You can see that from the lock screen, which uses the same abstract oil painting image as the Note 3. To wake the screen you swipe your finger on the display, and the paint smudges satisfyingly under your touch. It shows the bright, vivid colours Samsung screens are known for. Though this is less gaudy and over-saturated than previous ones, it must be said, with Samsung opting for LCD instead of its sometimes-favoured AMOLED technology. The resolution here is very high - 2,560 x 1,600 - which adds up to 299 pixels per inch. This is significantly more than the iPad Air's 264ppi. Even so it's hard to say that this screen is better than Apple's - both are highly usable. As you'll know, we're not mad about tablets as cameras. Big, flat, heavy and awkward in the hand, tablets are ergonomically unsuitable. Even so, a lot of people use them for photography because they've got those big gorgeous displays so you can see your shot in great detail. And to be fair to Samsung, the sensor here is decent enough - it's 8MP resolution and even comes with a flash, unlike most tablets. Flash is a mixed blessing, of course, as it can simply white out all detail. But there are extra features such as face and smile detection to make things a little more interesting. It also manages full 1080p video recording, which is jolly enough. There's plenty of oomph to the Note 10.1 2014 edition, thanks to a stonking 3GB of Ram and a quad-core processor. The model differs according to whether you plump for wi-fi only or the model with 3G/4G connection. Both are Qualcomm Snapdragon 800 chips. It works well, with no lags, even when two apps are running side by side. Samsung says the battery lasts for 10 hours of active use and that certainly fits with our experience. There's certainly plenty of room for a big battery and the 8220 mAh capacity is plenty here. Samsung's tablets get classier and better each time. The Note 10.1 2014 edition is excellent. It's effective, well-built and has a gorgeous screen. It's well-sized, light enough to manage and the S Pen stylus is a very well executed addition. It's not cheap, and there are plenty of alternatives that are almost as good as the Note and will save you money. Still, this is a fine and appealing tablet with lots of features and a great processor running it all at speed.